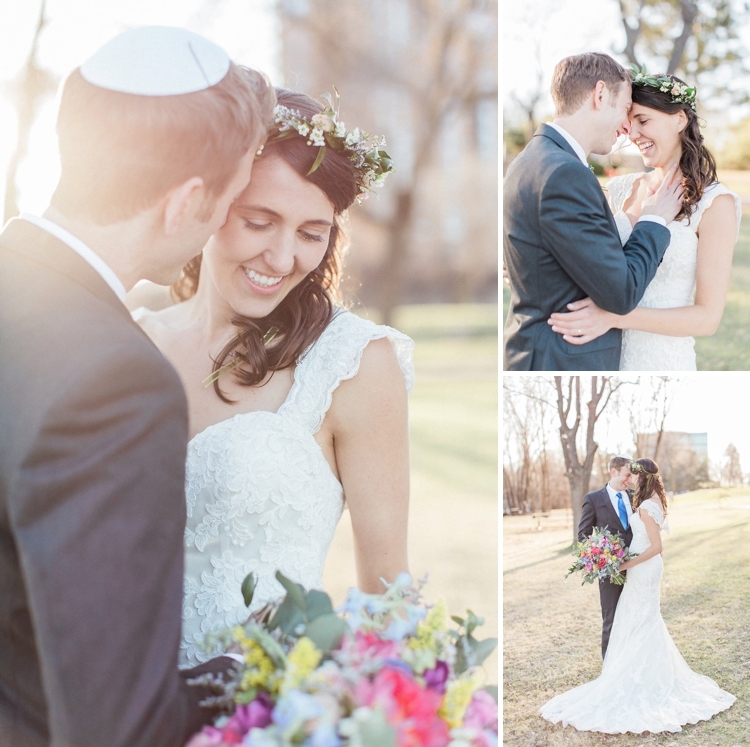 This is the love-filled, creative Jewish wedding of Talia and Yoni. 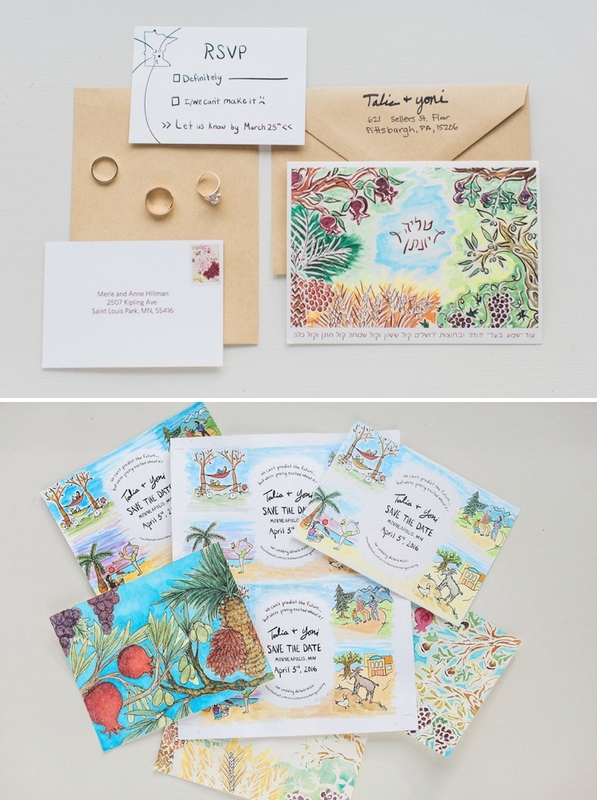 Talia’s wedding report is fabulous, as are her artistic talents — she designed all the wedding stationery and each and every painting that graced the reception tables. There is so much meaning and symbolism to this wedding to reflect the couple and their loves ( and when I say ‘loves’ I mean in the sense of what they adore, and their nearest and dearest). So for instance, they had originally dreamt of a small, casual, wedding in Israel, but being surrounded by family and community trumped this desire. 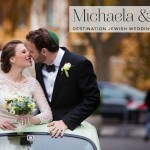 So whilst they chose to have a wedding on their home turf of Minnesota, they channeled an ‘Israeli style’ by having their guests standing around them informally during their ceremony, open seating during the meal, a buffet lunch filled with fruits, veggies, fresh breads and pastries, and plenty of Israeli music on their playlist. 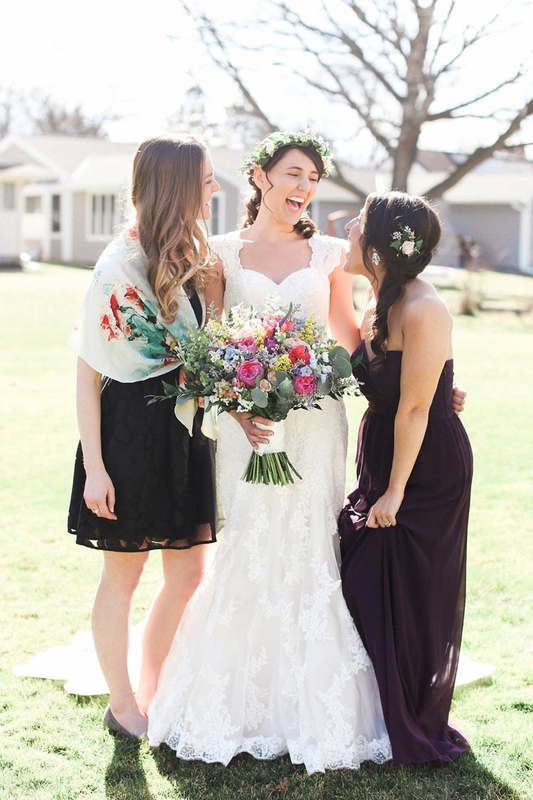 Absolutely every detail was thought through and beautifully styled, but I must just take a moment to single out Talia’s bouquet, flower crown, and the chuppah. They really are to die for — just so gorgeous, natural-looking, colourful and creative. 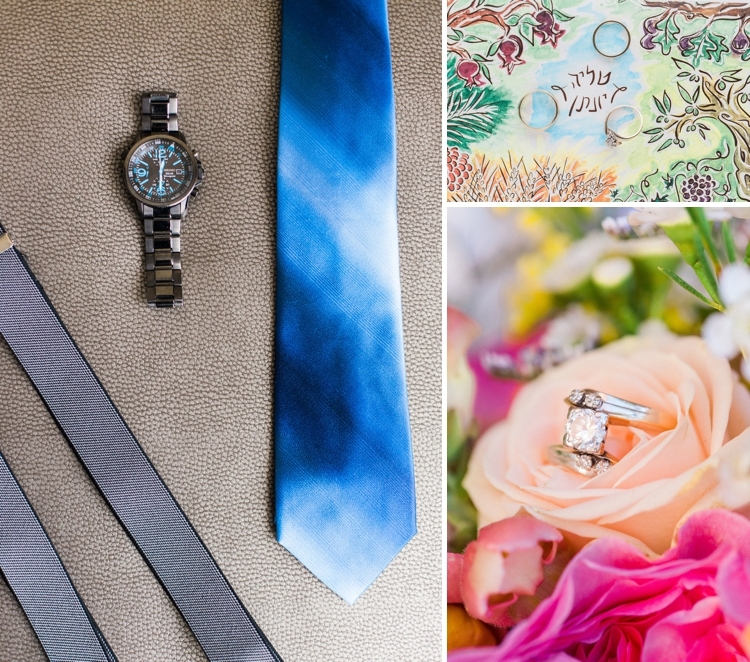 Do take a moment to read through Talia’s beautifully written account of her planning, prep, and what the traditions meant to her and Yoni. There are some really useful tips and a big dose of super advice all the way through. Talia, the Bride: We met a Hebrew speaking, hummus tasting event that I had organised with my roommates called “Hebrew Shmebrew.” I was initially intimidated by his fluent Hebrew, so we hung out a couple more times with friends before he called to ask me out. We happened to live three blocks away from each other, so the rest is history! The day after we got engaged, we were on a walk with my parents around the lakes, and on our walk we passed by The Calhoun Beach Club. My parents said they had been to two weddings there – so we just walked in to check it out. 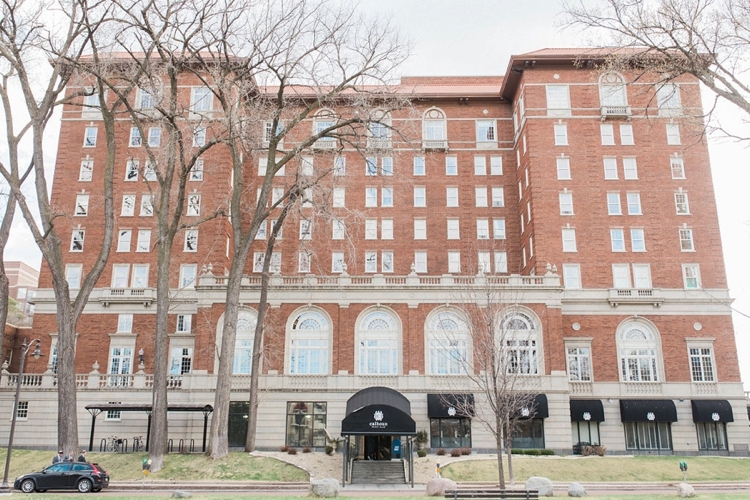 We loved the big windows, the natural light, the outdoor patio, and the view of Lake Calhoun. 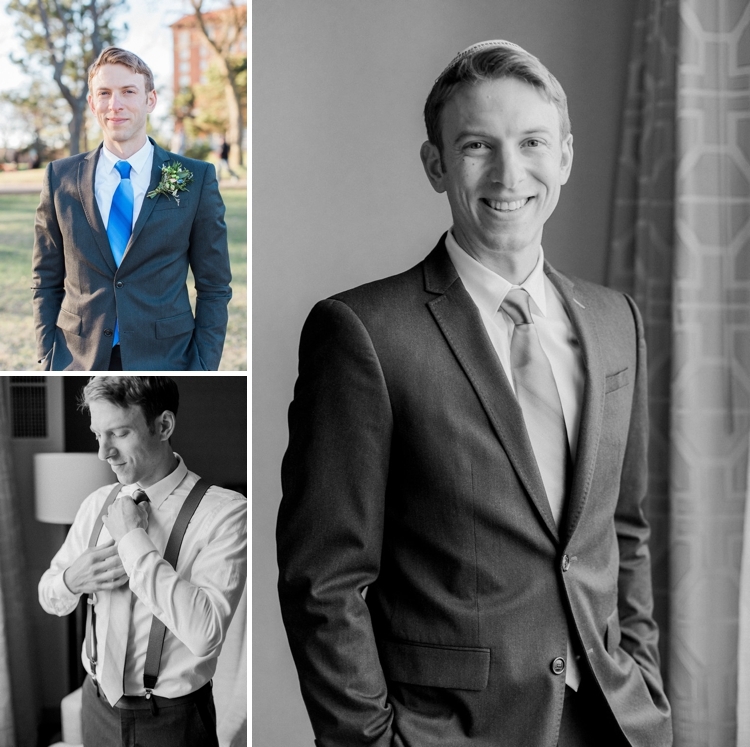 I (bride) have spent hundreds hours by running, walking, kayaking, swimming, meditating, and picnicking around Lake Calhoun – so it was a very familiar and comfortable setting! 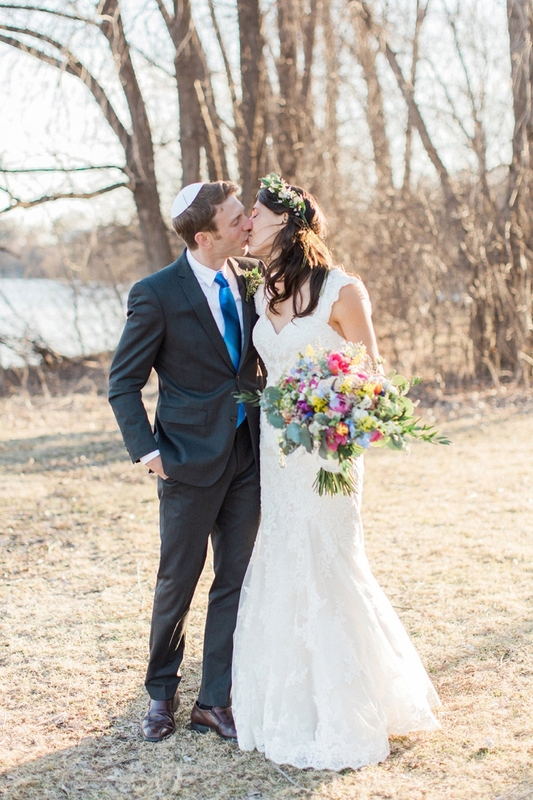 If our wedding were a smoothie – it would include a mixture of our roots: a high energy boost of Jewish traditions, Danish/Scandinavian values of “logum” (moderation)/ quality over quantity, the outdoorsy and laid back essence of Israeli culture, and nature’s best from flowers to delicious fruits and veggies. 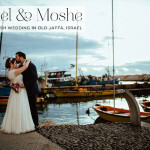 We originally dreamt of a small, casual, Israeli wedding among the mango groves or overlooking Lake Kinneret or the Mediterranean, but family and community trumped all for us. So we brought the best pieces of our Jewish, Israeli and Scandinavian traditions to my home town, Minnesota! 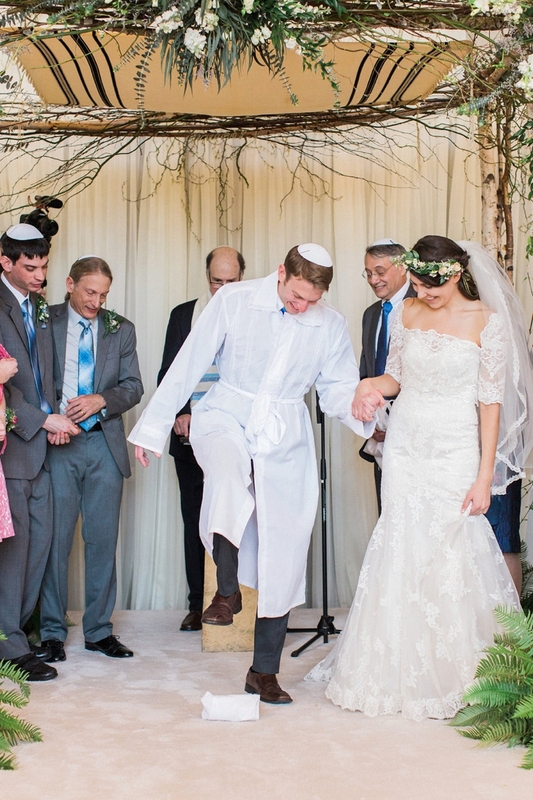 We had all the traditional parts of a Jewish wedding: The men’s tisch, kabbalat panim, chuppah, Sheva Brachot (seven blessings), klezmer band, simcha dancing, shtick, benching… the whole shebang. We channeled our Israeli style with our guests standing around us during the ceremony, open seating during the meal, a buffet lunch filled with fruits, veggies, and fresh breads/pastries, and an Israeli/Latino playlist. 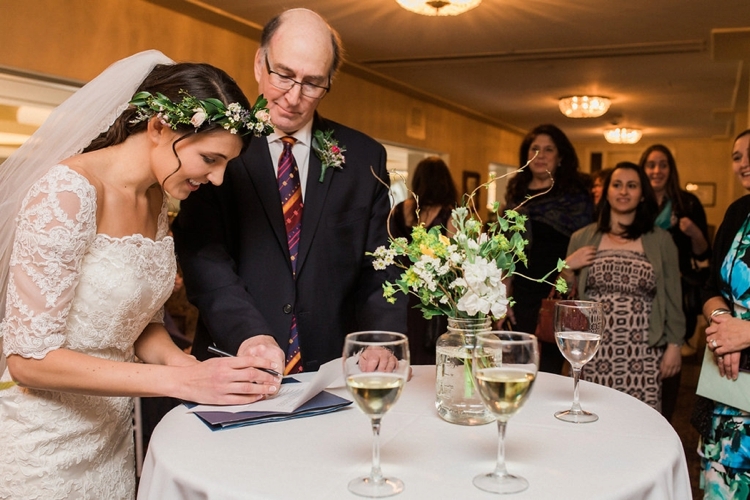 And although we love the outdoors – we prioritised our excitement to start married life, so we got married in Minnesota. So while we obviously weren’t going to have perfect Mediterranean weather – we choose a venue filled with natural light and access to the outdoors and views of nature. And to top if off…we got incredibly lucky with a gorgeous day that was 65 degrees and sunny! Twice during simcha dancing, the entire crowd danced out of the room onto the patio outside! 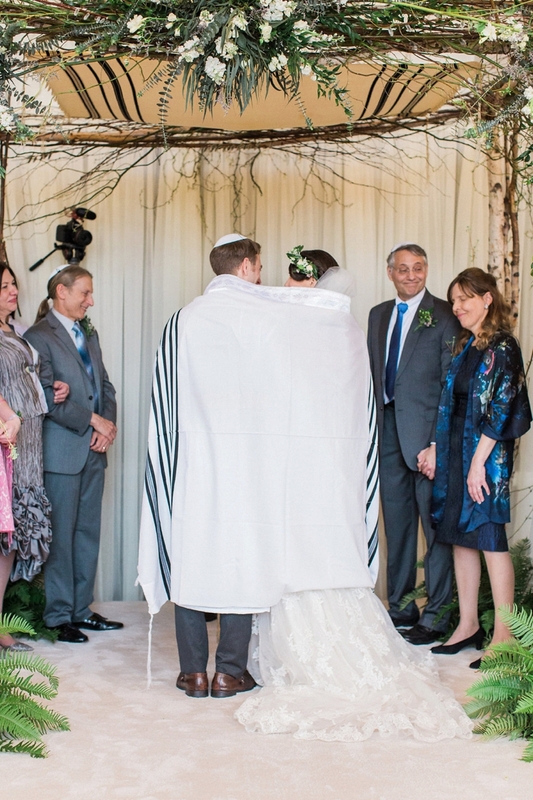 And last but not least – we wanted to highlight our families – so instead of a formal bridal party, we had our families walk us down the aisle and stand next to us under the chuppah. 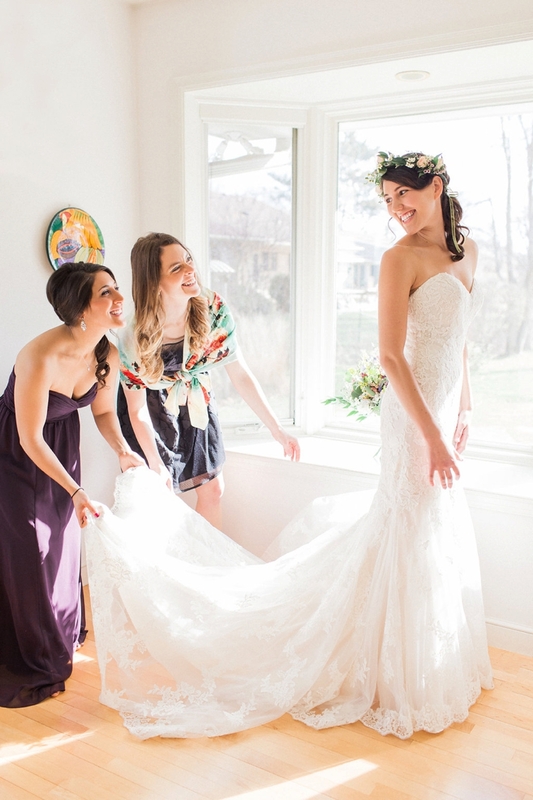 We honoured friends in different ways, and loved how inclusive it made the weekend and day. I have had a life long passion for art and design, so this was a natural project for me to take on. I designed and illustrated the Save the Date and the invitations. It was fun to share the creative process with Yoni, and literally visualise our past and future, and represent the international framework that makes us who we are. We wanted to highlight our love of nature and produce, our connection to Israel and tradition, and our multi-lingual families. 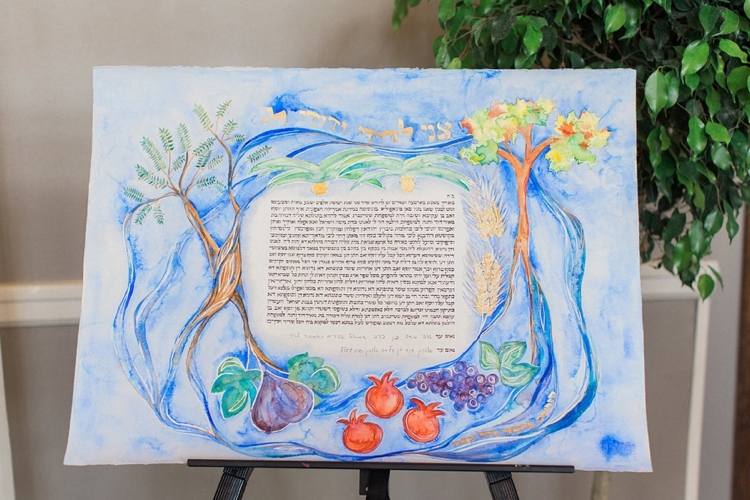 We decided to feature the Sheva Minim, the seven species native to biblical stories of Israel (pomegranates, dates, olives, grapes, figs, wheat, and barley), since we had just come back from Israel where we literally picked pomegranates off the trees and visited amazing wineries. 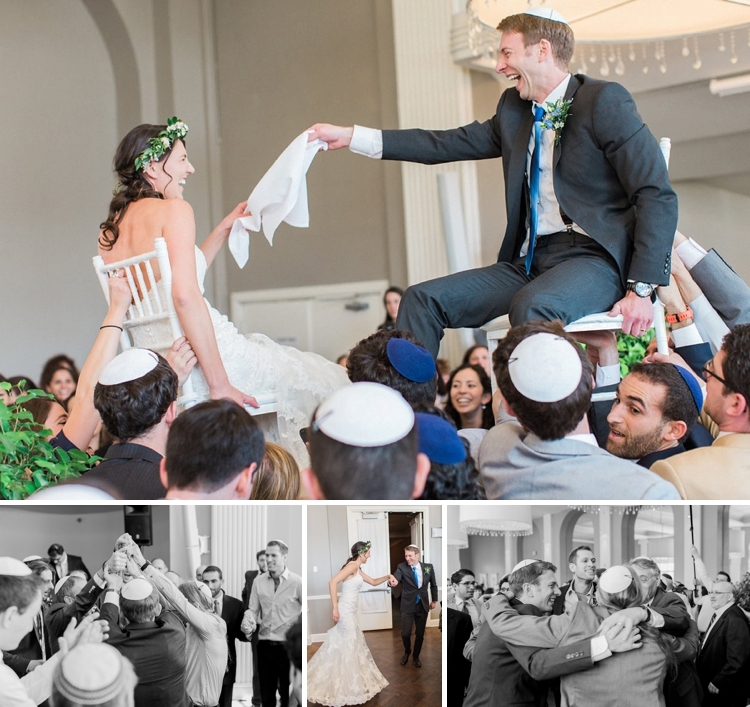 To capture the traditions of singing and dancing in Jewish weddings, we included a line from one of the most famous and energetic Jewish wedding song (Od Yishama): “Od Yishama Baarei Yehuda Ovechusot Yerusalayim, Kol Sasson V’Kol simcha, Kol Chatan v’kol callah.” – Translation: “Yet again there shall be heard in the cities of Judah, and in the streets of Jerusalem. 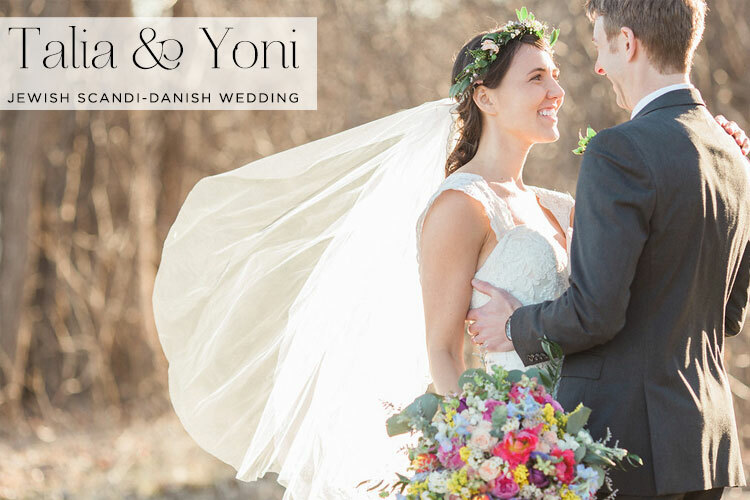 The voice of joy and the voice of gladness, the voice of the groom and the voice of the bride” To include the many countries and languages that represent our families, we made the invitation tri-lingual… Hebrew on top, and English and Danish below. The Save the Date was an equally fun project for me. I drew different elements of our past adventures and anticipations of our future lives together. I illustrated images of: biking and camping trips through Denmark and Norway; travels to warm, tropical places filled with space for creativity and yoga; anticipation of future hikes- kids and babies in tow ; and our dream to spend time in Israel growing our own olive trees and have a goat farm. Fun fact about my husband- Yoni used to be a goat herder! One of my best childhood friends, Riki Konikoff, is a hair stylist, and I love her work and her creativity. She did my hair and makeup at my childhood home. It was just like the old days – playing dress up while my brothers ran around. Riki came over the day before to do a test run, but I still couldn’t decide whether to have my hair up or down… she was so patient with me, and the hair ended up being half up, half down- it was perfect! She is so so talented, and lives in Boston if anyone is looking for a hair stylist 🙂 I also had a village of ladies with me as I was getting ready – my mum, my mother-in-law, my 2 sister-in-laws, and two of my best friends. It went quick though because the wedding started at 11:00 am! My dress was from The Wedding Shoppe in Saint Paul, Minnesota. It had a light, springy, simplicity, with subtle intricate details – and it fit me like a glove. The dress was sleeveless so I had a cover-up made to wear during the traditional ceremony, and then a set of thick straps that snapped in to the dress to wear the rest of the wedding. I ended up taking them off during the dancing – because I just needed full range of motion for the crazy simcha dancing. 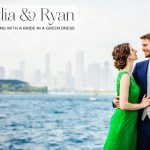 Barb from Bridal Alterations Pittsburgh was incredible, creative, and found lace and a design that made the various pieces fit seamlessly with the dress. Flats. flats. 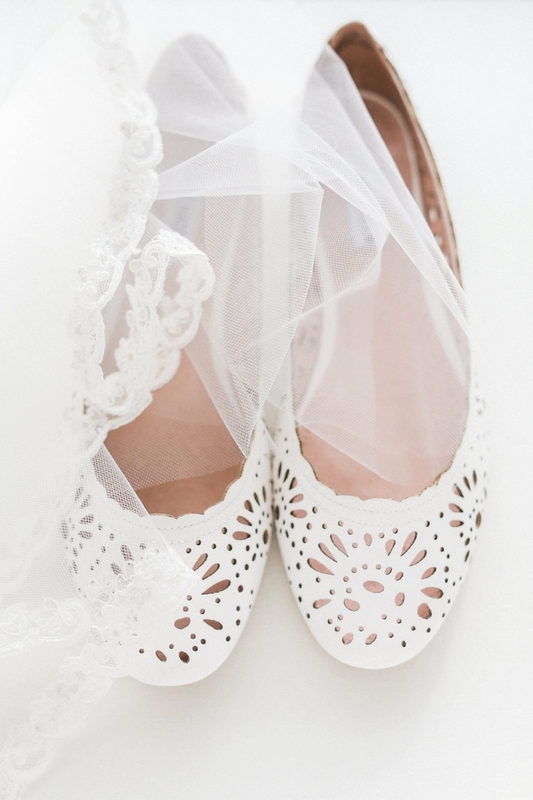 flats all the way! Dancing was the priority. 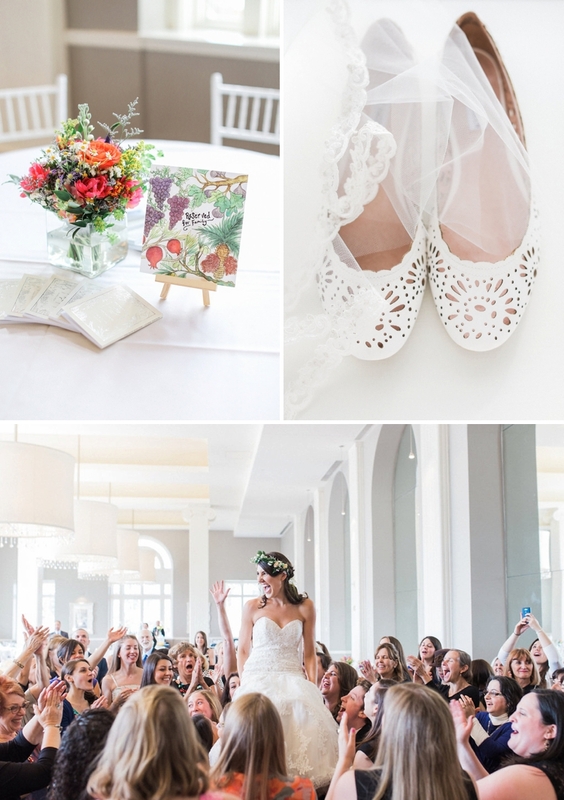 I found white, Steve Madden flats, laser cut in a floral pattern that matched the dress perfectly. I wore a veil for the badeken and ceremony. 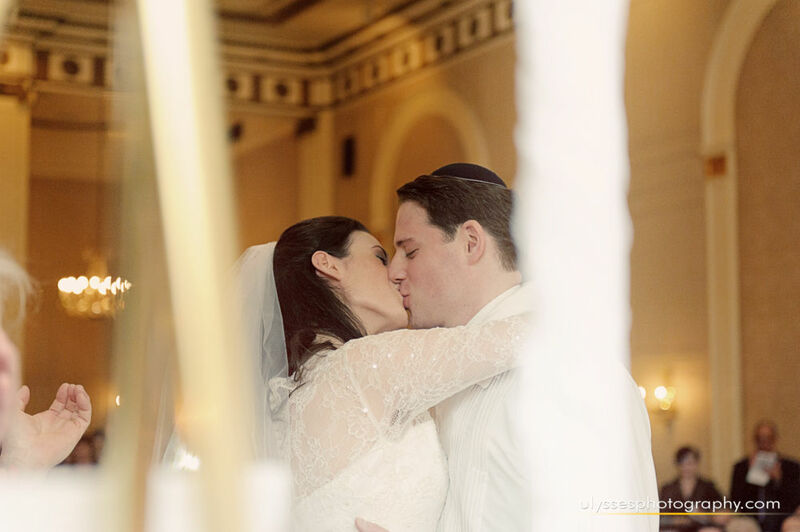 The veil plays an important role in the context of several Jewish wedding traditions, and those moments were some of my favourite. I gave Yoni creative license to wear whatever he wanted – I told him I would marry him in shorts and crocs and would even marry him with a beard. But, he dressed to impress and wore a dark grey Zara suit, braces, and a blue tie, and even shaved 🙂 Yoni is the kind of guy who never wants to dress up and never buys himself dress clothes, but always puts together the most handsome/trendy/fitted get-ups, with a new twist each and every time. So, I knew he’d come up with something great. No bridesmaids, no colour set colour theme, no requirements… I just wanted everyone to be there wearing whatever made them feel great. The family and friends that were a part of the procession or had a role in the chuppah had a boutonniere, corsage or small floral hair piece. The Hillman boys all ended up picking suits in various shades of grey with blue ties and then the Steinbergs went along with it! Yoni and I choose to partake in the tradition of not seeing each other the entire week before our wedding. The first time we saw each other was at the Badeken, when the groom is danced in, surrounded by his guys (my brother carried Yoni in on his shoulders) and the Bride is sitting in anticipation with her ladies around her. Yoni’s entrance will forever make my heart flutter- it was the most emotional and powerful moment of the wedding. 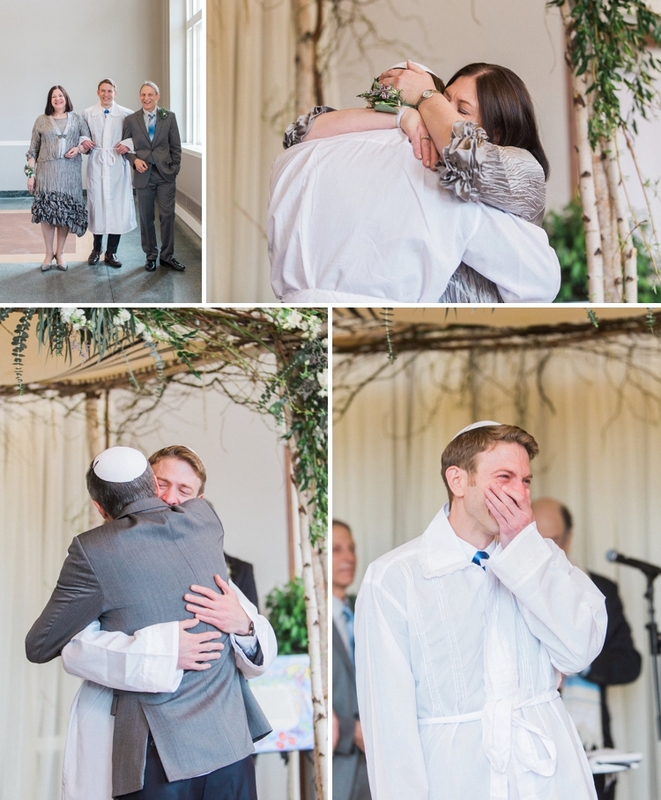 After being danced all the way up to the bride, the groom covers the brides face with the veil, and the bride wears the veil until the last portion of the Chuppah ceremony. Even though we had hundreds of people around us- that moment- when Yoni covered my face with the veil, will always stick out to me as so intimate and exciting. Not seeing each other the week before was absolutely worth navigating some tricky logistics. The build up allowed so much raw emotion and excitement to show in ways we couldn’t have anticipated. 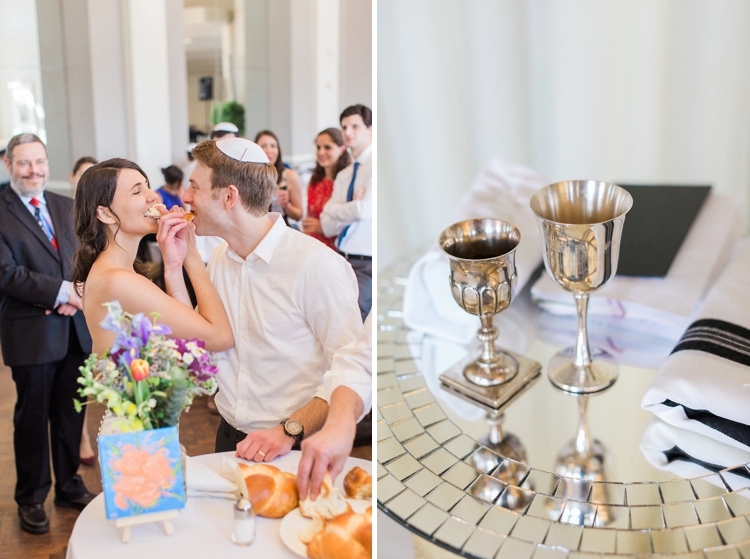 We used Yoni’s great-great grandfather’s talit for our chuppah, and my great-great grandpa’s Kiddush cup. 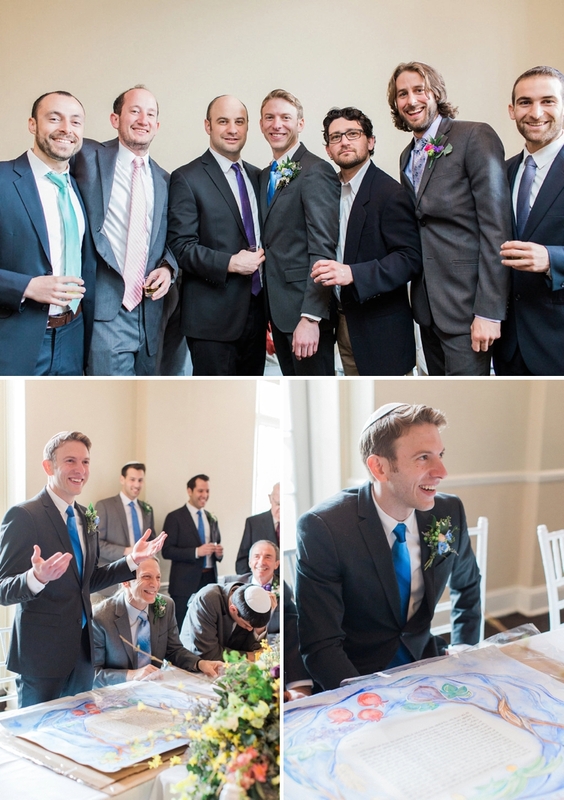 The Rabbi who married us was Yoni’s Rabbi from Pittsburgh, whose son is also Yoni’s best friend and who was the M.C. for the Sheva Brachot. We had two ring bearers – it was special to each have an amazing friend come up and give us the ring that we in turn gave to each other, and share the height of the moment with that friend. 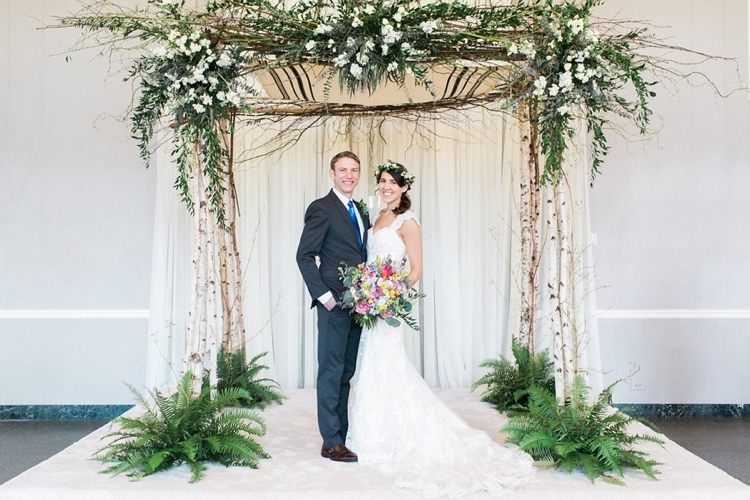 We worked with Richfield Flowers and Events to design the chuppah and other floral elements for the ceremony room. 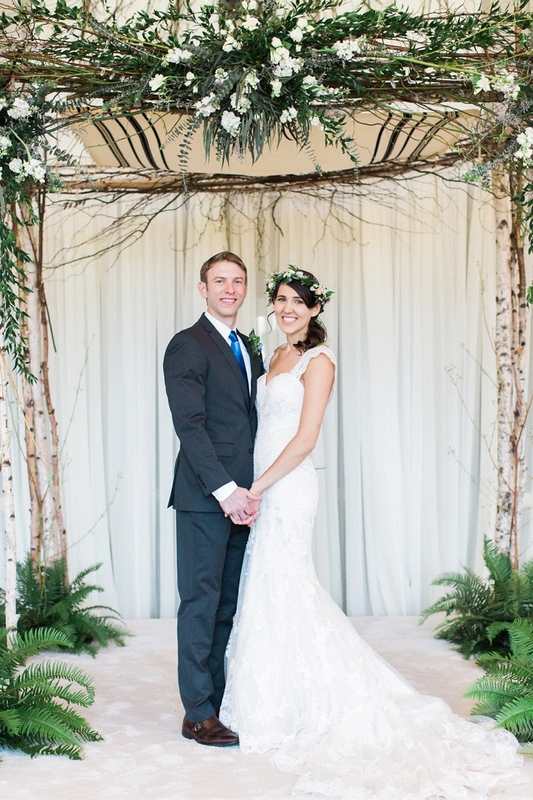 We brought our love for raw nature indoors, using birch wood branches for the frame, with rustic branches, accent greenery, and white flowers to surround and highlight the tallit. 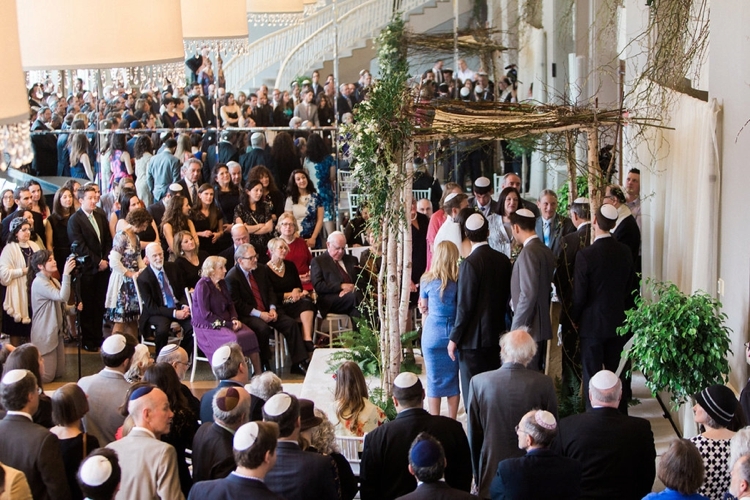 We gave Richfield Flowers some examples of chuppah designs we liked, but also gave them creative license to add natural elements on the balconies and around the room- and loved their work. 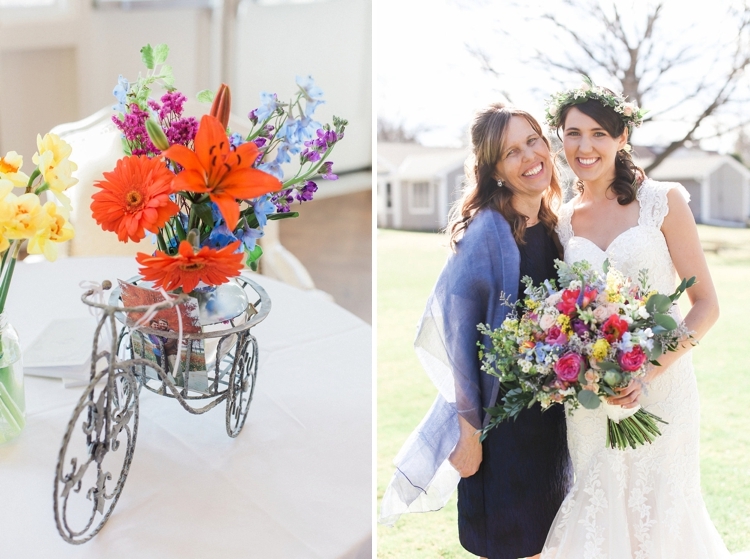 Their design captured a very natural, rustic, Midwestern style, while also portraying an elegance and beauty.. It matched the time of year as well – the very beginnings of a Minnesota spring. 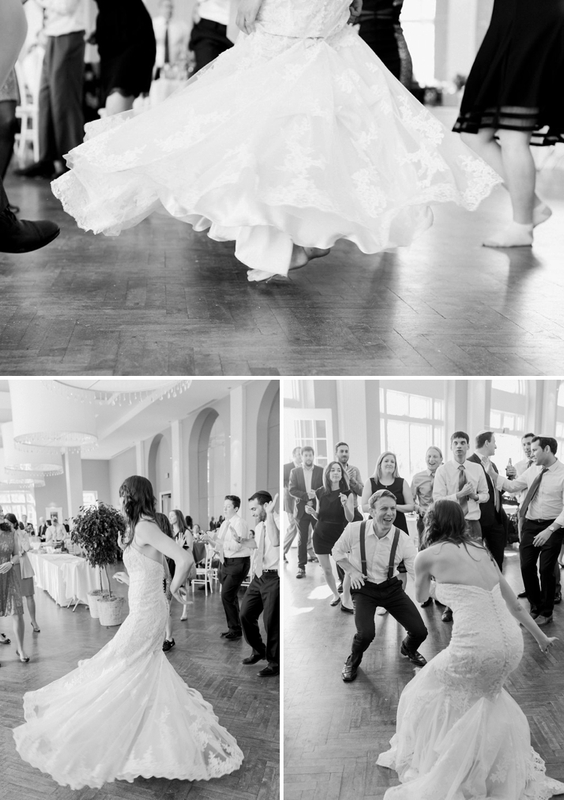 We had traditional Jewish, wedding music playing during the ceremony and then upbeat klezmer, simcha dancing music for the first round of dancing. Our good family friend, Ned Cantor, has an amazing music business and puts together an incredible ensemble for weddings. We told them we were most excited for the simcha dancing- and anticipated a 30-45 minute set, and they kept everyone dancing for over an hour! After lunch, we continued dancing to a Israeli/Spanish playlist we had created. We kept a small 3-piece set from the band around to play Jazz music in the boulevard room, for those who wanted a more quiet, relaxed space to dance or just enjoy the music. One of Yoni’s close family friends, Katie Stoner, works on a flower farm in Ithaca and offered to help us with our flowers. She helped us select and source the flowers, and flew in two days early to create all the arrangements for the centrepieces, accent mason arrangements to put around the room, my bouquet, flower crown, and the corsages, and boutonnieres. She is SO talented – every arrangement was unique, complete with a variety of colours and flower types. It captured the essence of quality over quantity. 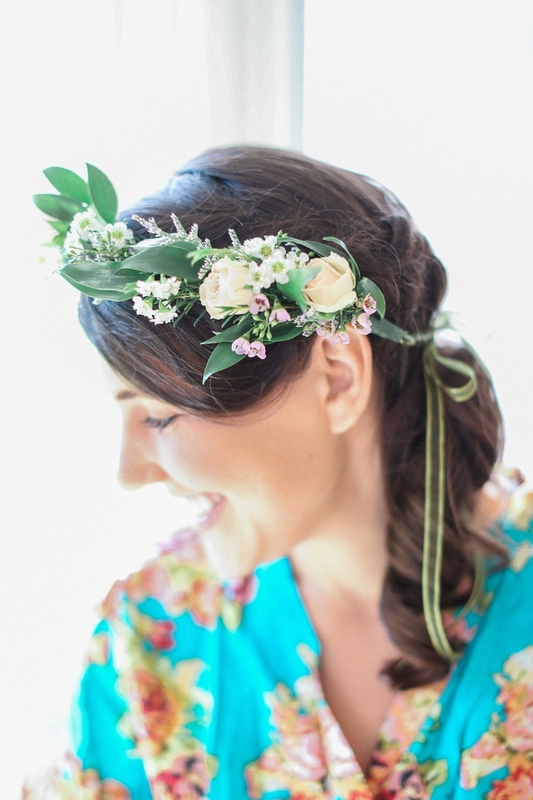 My bouquet and flower crown were a bride’s dream come true – I felt like a spring fairy bride. My friends were extremely helpful in making it all happen- they opened their homes to give Katie a space to work and helped with the transportation and set up. Looking back at the pictures, I discover more beautiful details in the flowers each time. My advice to future brides is to give some creative license to your florists! 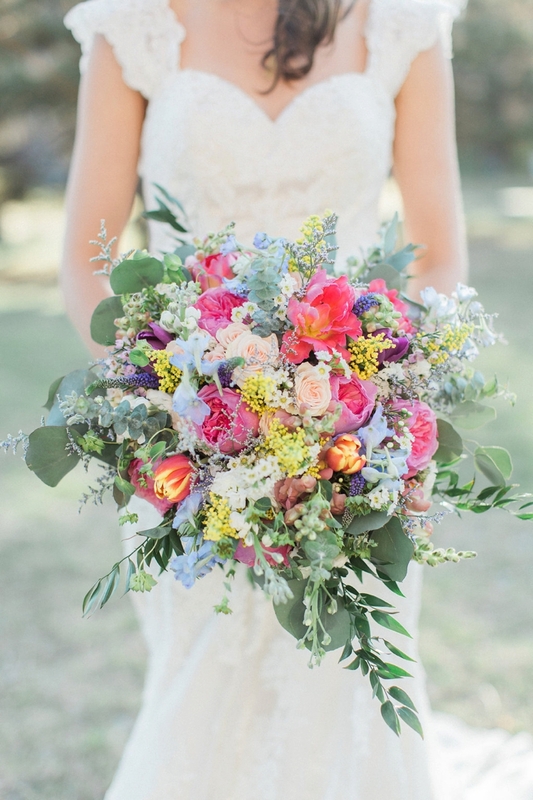 It’s incredible to see what original flowers and combinations that result! Lauren Demby defines the art and fun in photography. Her skills for using natural light and capturing high intensity, emotional moments is breathtaking. She even weaved her way in an out of the most crazy dancing circle, and risked getting trampled to get the best shots! 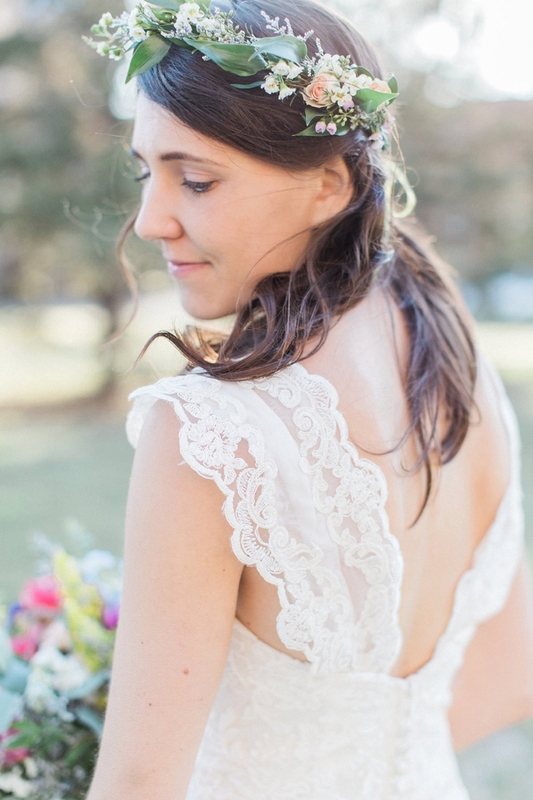 She was so fun and calming and accommodating of our alternative ideas throughout the wedding. We took our portraits after the wedding and she did an incredible job making us look our best — even after SO much dancing. I am so so happy she photographer our wedding- every picture is a piece of art. Why have one cake when you can have an incredible spread of delicious small pastries and desserts? We wanted a dessert station that reflected our love for European style bakeries- many varieties of small, delicious sweets. 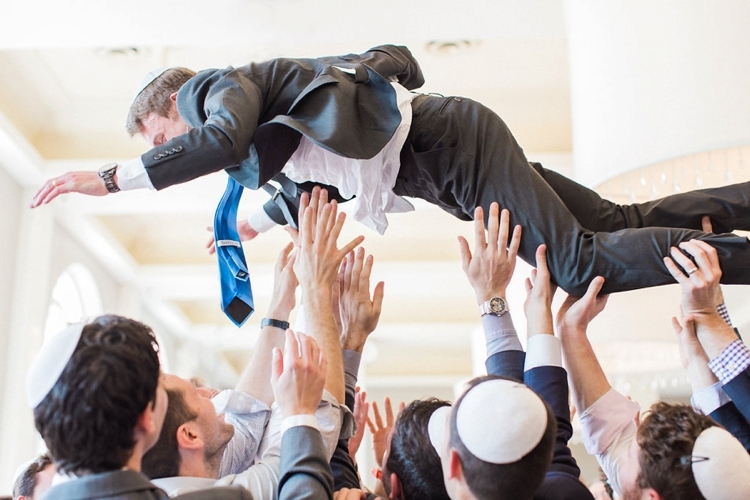 None of our entertainment was planned – but there was plenty of it… During the simcha dancing, our friends and family came through with the most incredible “shtick” we’ve ever seen. From creations of a human bicycle, to yoga poses, to Yoni’s army buddies and my dad doing push ups, to family dancing around with Danish and Israeli flags, to Yoni college buddies assembling their “Octagon” sign, to friends and family busting out costumes from every phase of our lives: neon orange high school lacrosse jerseys, penguin outfits, shepherd costumes, army barets, Japanese umbrellas and robes, charredi hats, bike helmets… spraying silly string and bubbles, it just kept coming! At the end of the wedding, my brothers capped it off with their own original lyrics to an old Irish drinking song- making lots of fun of our registry and our love for weird, organic foods. A buffet lunch, rather than plated meals lends to delicious food – food stays warm and moist, everyone will find a dish they like. We even went vegetarian – and we had raving reviews about the food. 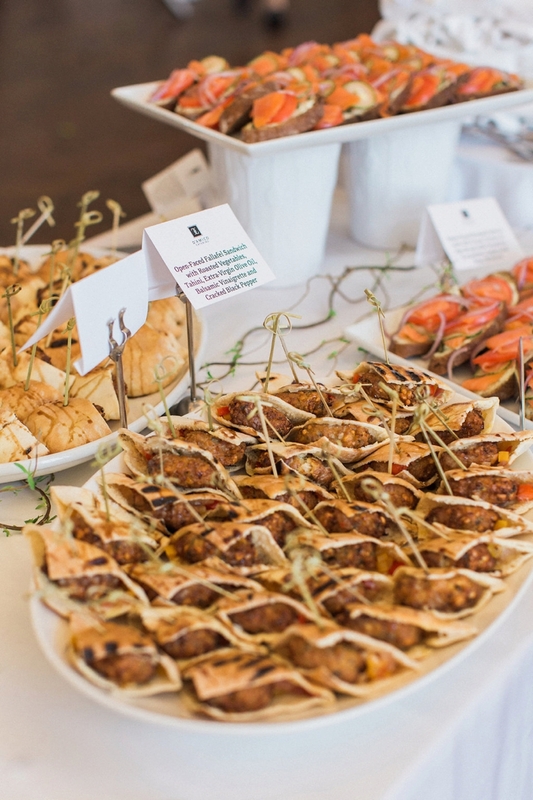 D’amico Catering provided an incredible service! Don’t get too wrapped up in the pressure to look perfect. There will be always be something else that you can do – teeth whitening, buying one more dress option for the wedding weekend, one more workout… Just prioritise sleep and take the week before the wedding to really zen out. Whether a it’s a walk in the woods or reading in a coffee shop, take some time for yourself to internalise what the wedding means- and put the details/logistics aside. Take time to prepare for your marriage – not just for your wedding day. Read and learn about being a good partner, talk with married couples who you admire. Talk with your future spouse about new traditions you want to start to make married life a step up from dating- whether a morning coffee date, cooking together, taking on or discarding certain religious traditions, or family traditions to incorporate in your new home. Just get excited – there is nothing as exciting as being surrounded by everyone you loves who has supported you through your best and hardest moments. Everyone is there for you! 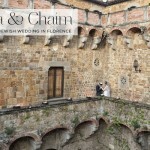 Chuppah Florals & Details — Richfield Flowers & Events, Inc.
What an exquisite post! I am feeling energized when I read it and feeling so happy in the wake of seeing every one of the clips from you.